Drugi podatki Ideal for grubbing, land clearing and loading of wood waste materials. 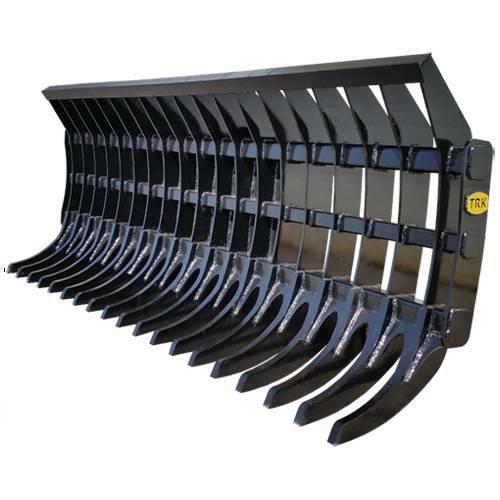 This type of rake can also be used for backfilling and leveling material. Visit our website at www.trkattachments.com or give us a call for a quote at 905-641-9981. Na Mascus.si lahko najdete stroje znamke [Other] TRK Loader Rake iz kategorije drugo. Cena tega [Other] TRK Loader Rake stroja je -, registriran je bil leta 2019. Ta stroj se nahaja v TRK Attachments Kanada. Na Mascus.si lahko najdete številne druge stroje znamke [Other] TRK Loader Rake ter seveda druge stroje iz kategorije drugo.